OUR PRICE: $19.80 - Join Rewards Get $1 Dance Dollars On This Item! 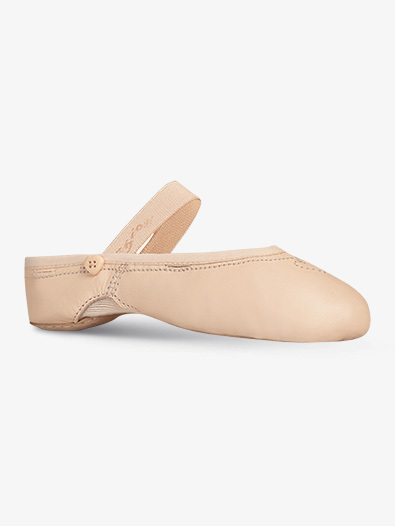 Capezio's "Love Ballet" Shoe features growth pocket technology that accommodates up to a 1/2 size of foot growth! Other features include a leather upper, elastic binding with no adjustment required, a suede sole and an adjustable instep strap with a heart shaped button on each end. Ordered these shoes for a bunch of my preschool age students and I absolutely LOVE them. Not having to deal with the stress of tying and re trying strings or cutting strings is awesome. They do run VERY true to size so I'd suggest always going with your child's shoe size. If they are in a half size order up. My only complaint is that they do fall down on the heel a bit and the buttons rub if worn without any tights over the foot. But overall love these shoes. These shoes are really cute, but the sizing is weird. I bought these for 4 of my little ones and some of them fit weird. Size 1 and 13 are true to street size, but they don't come all the way up on the back of the foot, so they feel uncomfortable for the little ones feet. Plus I got 2 pairs in wide and they are very narrow, the elastic going across the foot is extremely tight. The size 11 is perfect in every area except for the back its low cut on the heel. The size 10 is so very small, it runs about 1 size small. So like I said the sizing is weird, but they are really cute, so I would suggest trying them on in store to find the right fit, before ordering them online. This is our second pair of ballet shoes in this style. The first pair lasted the entire season and really held up well. As a dance teacher, I love these shoes for young children. It saves an incredible amount of time in class because the young ones can't untie anything! I just purchased these for my daughter and was very impressed with the flexibility of this shoe and the amount of stretch they have as well. We put them on and she wore them around for an hour with no complaints. I teach dance so I thought I would try these out on my 3 year old before I recommended them to my students. My daughter has a pretty wide foot even with wide shoes I normally have to order a size bigger for them to fit right. I order these true to size and they fit perfectly. The best part is there is no laces!!! I was worried about the mesh part ripping but she has had them since Christmas with no problems. The only reason I did not give them 5 stars is that after a couple of months the button came off and I had to sew it back on. Is this a split-sole ballet shoe? It does not say in the description that it is split sole. The hybrid sole design creates the best of both worlds by having a two part suede sole that allows the shoe to work as a full sole and a split-sole. I have noticed these are child sizes, does that mean toddler? We dont typically say child vs toddler as each child is a different size, as it is not based on age. However, a toddler could potentially wear these. Use street shoe sizing as a guide as these run from an 8 through a 2. My daughter has out grown some 12's but many 13's slip off her feet. Which size should I buy? I would recommend a size 13.0 in this shoe. Unfortunately, this shoe does not come in half sizes. If you would like assistance finding another slipper that is available in a size 12.5 please contact Customer Service. I was wondering if these are a full sole slipper? You can't tell in the picture and it doesn't say in the description. I was looking to get these for my daughter. She is 4 and wears a size 10 in shoes and the adjustable straps sounded like the way to go. These ballet slippers have a split sole.